The Option Institute Blog: CAN YOU HAVE A LOVE AFFAIR WITH A CAR? CAN YOU HAVE A LOVE AFFAIR WITH A CAR? A car can’t hug you. It won’t take care of you when you have a fever. It won’t cheer you up when you are feeling blue. Okay – is this a guy thing to have a love affair with a car? Actually, one of my granddaughters loves cars – she likes to look at them, identify them and talk about the dream car or cars she will eventually buy for herself. So the answer to the question – can you have a love affair with a car? – is ABSOLUTELY. I bought my dream car in my mid-twenties (I had achieved success at the time working in the motion picture industry) and kept that car for twenty years. I tend to stick with the relationships I choose. I loved its classic lines. And the very glamorous front grill. And this vehicle cornered around the curves in the road like a sports car although it was a very, very large four-door sedan. Inside…well that’s another story. Soft glove-leather seats, dark wood trim (real wood) and a cabin as quiet as a meditation room that floated on wheels. And the motor – well, it just purred at stops signs and roared when you pressed the accelerator to the floor. 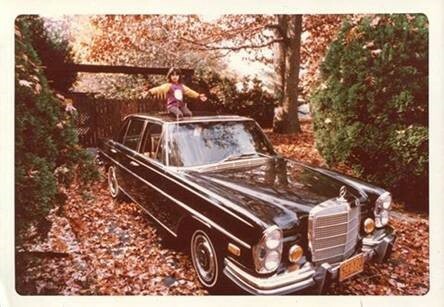 Me and my car – well, we were an “item” (not for anyone else but all in my own head). I would even tap the fender from time to time and express appreciation out loud…oh yes; I would talk to my car. All relationships really need active authentic verbal exchanges. This particular photograph of my car is very special to me because one of my children sits atop the vehicle, with feet dangling through the sun-roof. That little person also loved that car, especially the hole in the roof. Eventually, my car and I went our separate ways. Today, and for the past 16 years, I drive my beloved Toyota SUV – yes, yes, it’s another long term love affair. What I have learned (and which began all those years ago) is simple: WHATEVER YOU DO, WHATEVER YOU ACQUIRE – DO IT WITH GREAT ENTHUSIASM, DO IT WITH MEANINGFUL APPRECIATION…DO IT WITH LOVE! Cars. Furniture. Toasters. Coffee-makers. Mattresses. Houses. Smartphones. Sandals. Your Facebook Page. A Favorite Hat. Oh, and yes, with people, too. Especially with people!!! Love, Bears Barry Neil Kaufman, Author “Happiness Is A Choice,” To Love Is To Be Happy With” and “No Regrets” and grateful to be key member of the Option Institute/Autism Treatment Center of America teaching staff.